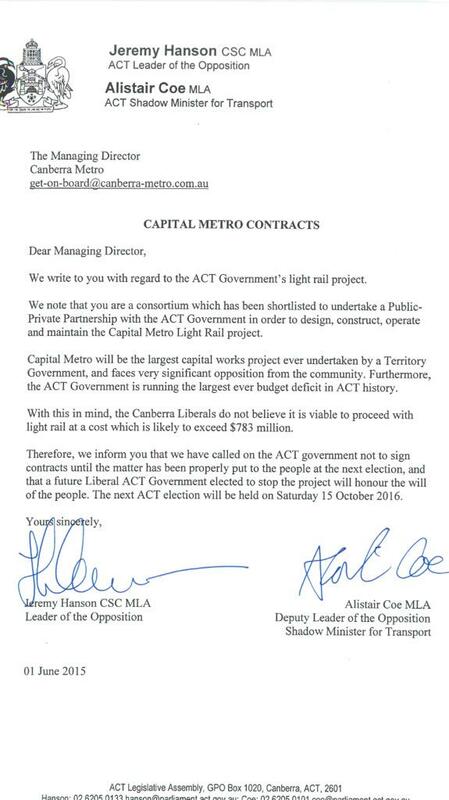 Opposition politicians MLA Alistair Coe and MLA Jeremy Hanson today emailed a letter advising the two consortia selected to bid for the Capital Metro PPP, that they might like to know that the Canberra Liberals don't want light rail. Instead of attracting $800 million of investment to Canberra, the Canberra Liberals alternative policy is to lease 50 buses. Read the Canberra Times article here. Read the ABC Online article here. 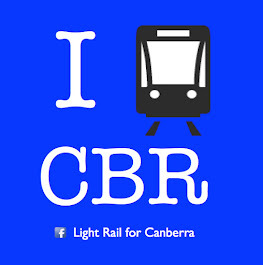 Federal Assistant Infrastructure Minister Jamie Briggs has warned the ACT opposition not to cancel contracts for Canberra's light rail line after the 2016 election, describing the move as "economic lunacy". Mr Briggs said the Abbott government's firm position was that contracts lawfully entered into by governments to build infrastructure projects must be honoured. His comments came a day after Opposition Leader Jeremy Hanson and Liberal transport spokesman Alistair Coe wrote to two international consortiums to explain a Hanson government would stop the $783 million project after the October 2016 election because it was not viable. Mr Briggs' comments follow Prime Minister Tony Abbott's criticism of the Victorian Labor government's decision to tear up contracts for a controversial tunnel project. "As we have seen with the East West Link disaster in Victoria, tearing up legally binding infrastructure contracts raises sovereign risk, damages investor confidence and stifles economic growth," Mr Briggs said. "Australia needs more private sector involvement in infrastructure, not less. In this respect threatening to tear up contracts is bad enough but to follow through with this threat is simple economic lunacy that will damage not just the jurisdiction involved but the broader economy." Read the full Canberra Times article here. ABC Canberra covered the response here. WIN TV Canberra covered the response here.